Un groupe de chercheurs, utilisant le télescope de 10 mètres de l’Observatoire W.M. Keck (Hawaii), ont découvert un corps planétaire possiblement recouvert de calcaire et dont les couches superficielles sont érodées par son étoile désormais morte. En effet, en plus d’appliquer une méthode relativement nouvelle permettant de déterminer la composition chimique des planètes afin d’examiner leur structure interne, l’équipe a constaté que le matériel rocheux accrété par l’étoile morte pourrait être composé de minéraux qui sont généralement associés à des processus de la vie marine sur Terre. L’équipe - composée de Carl Melis de l’Université de Californie à San Diego, et Patrick Dufour du Centre de recherche en astrophysique du Québec (CRAQ) de l’Université de Montréal - annonce ses conclusions à l’occasion de la 228e rencontre de l’American Astronomical Society, qui se tient cette semaine à San Diego. A group of researchers using the W. M. Keck Observatory have discovered a planet-like body that may have been encrusted in limestone and is having its surface layers devoured by its deceased host star. In addition to extending a relatively new method of determining the chemical composition of planets to examine their internal structure, the team found that the rocky material being accreted by the star could be comprised of minerals that are typically associated with marine life processes here on Earth. The team -- comprised of Carl Melis of University of California, San Diego, and Patrick Dufour of the Université de Montréal -- is announcing their findings at the 228th meeting of the American Astronomical Society this week. The researchers’ finding shows that SDSS J1043+0855 is accreting the surface of a body that has large enhancements of carbon. This feature -- combined with mild enhancements of calcium and oxygen -- points to the possibility of the material coming in the form of calcium-carbonate, a mineral that is often associated with shelled marine organisms here on Earth. Calcium-carbonate is attractive as a mineral constituent of this planet-like body as incorporating and entraining carbon in rocky objects (especially their surfaces) is difficult. The terrestrial planets in our solar system are said to live in a “carbon desert” since they are so heavily depleted in this element -- the planetary surface being accreted by this white dwarf star could have as much as several hundred times more carbon than the surface of the Earth. 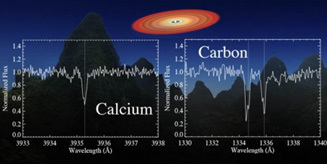 Specifically, the inferred presence of calcium-carbonate came from examining the atomic leftovers of the planet accretion event in the atmosphere of the white dwarf star -- after the presumed dust from the planet’s demolished surface was consumed by the white dwarf. The next step will be to look at the dust in a mineral state before it falls into the star, to both confirm its composition and to measure its concentration.